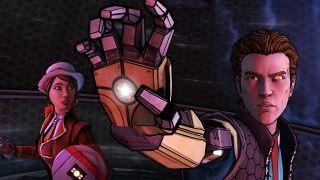 With the final episode of Tales From the Borderlands just four days away, Telltale has released a new teaser that comes off as considerably grimmer than I would have expected. That may not be an accurate assessment—I haven't yet got around to playing it—but the tone from the first trailer to the last has gotten considerably heavier. The important thing, obviously, is that the game is good, and Tyler certainly seems to think it is. But if I was viewing this trailer in a vacuum, I would likely expect Tales From the Borderlands to be all Heavy Drama, with occasional doses of Star Wars droid-style humor to keep things bearable. That doesn't sound much like the Borderlands games I've played. In any event, the Tales From the Borderlands finale, entitled The Vault of the Traveler, will be out on October 20. By now you've likely already decided whether it's a launch-day purchase, but on the off-chance you're still not sure, don't miss our reviews of the first two episodes, one here, and the second here.